Out of the whole Stellar Games roster, the game which seems to have prompted the most discussion over the years – not much, at least in the Anglosphere (apparently the Japanese translation was a minor hit over there), but at least it’s been namedropped here and there – is It Came From the Late, Late, Late Show. This came out in 1989, the same year that saw the nationwide cable debut of Mystery Science Theater 3000, and there must have been something in the water at the time promoting geekdom’s already well-ingrained love of cheesy movies – for Late, Late, Late Show is an RPG of playing through crappy Z-movies. Specifically, the conceit of the game is that your player character is an actor appearing in a terrible movie, and the action of the game is the story of that movie. So one week you might be fighting zombies, one week you might be encountering aliens whose spaceships look like pan lids attached to strings, and another week you might be tangling with a giant turtle from Japan who’s a friend to all children. The rules include features like a stunt double, who you can summon to take damage in your stead, “reel breaks”, where the party can declare that the bit where they solved the problem presently facing them got lost from the movie and they end up jumping ahead to a subsequent scene, and the option of just walking off-set in a huff in order to negotiate a better deal for your character. This is amusing in concept but muddled in execution. In particular, the text of the game seems to assume that combat will be a primary focus (though there’s numerous non-combat skills, all the examples of walking offset or other such capabilities revolve around combat), and the player characters resolve in-movie problems using their own skills (though they can get temporary, low-level training in skills they absolutely need for their role). This results in a striking level of ludonarrative dissonance, and whilst that may be the core of the joke, I suspect it would just bug me in actual play. By “ludonarrative dissonance”, I mean that the game mechanics as presented are incongruous with the premise of the game scenario. Essentially, the Late Show system is a fairly mediocre standard RPG system with a few mechanics tacked onto it reflecting the “you’re making a movie” premise. The thing is that when characters in a movie get killed by a monster or screw up that isn’t because the actor failed to be good enough at combat or the skill in question, or because they had a stroke of bad luck – it’s because the writers and director decided that that is what would happen. Perhaps the Late Show concept would work better as a fusion of an indie game and a traditional RPG, where you play as the characters in the movie under the direction of the GM as director until they get to a major decision point, at which stage you break to a “production meeting” where the players play various bickering stakeholders and production staff members to decide what should happen next. Once the decision is reached you continue playing through the scene, implementing the decision. You could have each of the PCs’ production team members have a different agenda, often orthogonal or even antithetical to the wellbeing of the PCs – the Special Effects artist might want the monster to look totally badass, the Studio Head might decide that one of the characters (perhaps not their own PC!) has more mass appeal and so would want them to look good, even if that’s at the expense of other PCs, the scriptwriter might want their Artistic Vision to be executed at all costs, and so on. You could have each scenario provide such win conditions, or come up with them yourself in a pregame “greenlighting” phase where you also come up with the concept of the movie (a bit like Fiasco‘s scenario creation phase). Add some means for influencing the Director one way or another (perhaps using a non-replenishable resource on a bidding system, so you have to choose when you want to force through your agenda and when to let things slide), and boom, you have a game which lacks the ludonarrative dissonance of Late Show and feels like making an actual movie. One other criticism I have of the book is the presentation. The font and layout and overall production values are rudimentary even considering the standards of the time (the 2nd edition came out well into the era when affordable desktop publishing software had made doing serviceable layout much easier and more affordable), and there’s constant irritating interjections from Demonna, a fetishwear-happy demon lady who I think is meant to be a riff on TV horror hosts like Elvira but instead is a vehicle for unfunny jokes and cheesecake art. 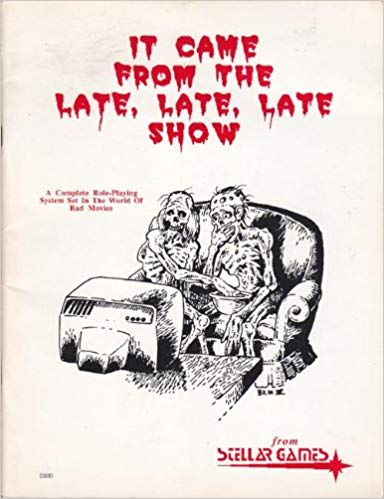 In general, I can’t recommend It Came From the Late, Late, Late Show – the concept is fun but it deserves a much better system than the one it got. This reminds me of that game Chroma Squad, where you’re supposed to be playing as actors on the set of a Tokusatsu show. I never played it, but the reviews I read criticized the fact that the battles felt too much like standard SRPG fights, with no explanation for how you can “lose” something that’s meant to ostensibly be a scripted show. Some people have the same problem with professional wrestling games, although at least there it’s arguably buying into the conceit of the genre itself. Yeah, with Chroma Squad/Late, Late, Late show what you really want is for people’s combat stuff to generate cool points against a collective “cool pool”, rather than damage directed at one participant or other, so in principle everyone’s collectively trying to make the scene as cool as possible (and so you can “fail” in the sense that you make a boring fight”). You could spice it up by having rewards based proportionately of how much you contributed to the final tally, so everyone’s competing to make themselves look the coolest I guess. With professional wresting games there’s really two ways you can go: address the fiction and make the fights competitive, or break kayfabe and make it a booking simulator.